“The Doomsday Machine“, unlike the previous episode “The Apple”, is an episode I know well merely from the title. The Enterprise encounters a terrifying and seemingly unstoppable planet destroying machine, with a hull made of solid neutronium and a horrible maw large enough to eat starships. 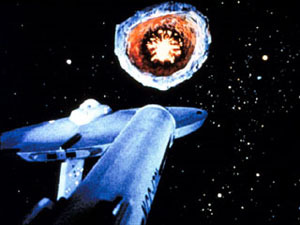 Much of the episode is a cat and mouse game of starship combat with this doomsday machine – a name given to it by Kirk when he speculates on its origin and purpose. Backtracking its path through destroyed systems, Spock concludes it has come from outside the Galaxy. Kirk surmises that such a destructive force could only be the ultimate weapon of a war of utter annihilation – a doomsday machine designed to destroy everything if its creators should lose. The parallels to the nuclear mutually assured destruction of the Cold War when this episode was made are obvious. But the episode doesn’t deliver a heavy-handed moral about this – it simply uses this set-up to drive a dramatic and compelling plot, with an Ahab-like rampage of revenge by the destitute Commodore Decker after he loses everyone on board his ship, the USS Constellation. Scotty says the antimatter on the Constellation has been “deactivated” – I wonder how that is done – but he starts work on getting the impulse engines running. Meanwhile, McCoy escorts Decker back to the Enterprise, where Decker pulls rank on Spock and assumes command, ordering the ship into a revenge chase of the machine rather than going to pick up Kirk. McCoy objects and tries to declare Decker unfit for command, but Spock points out the regulations require a medical examination first, which he hasn’t had time to do. Scotty gets the Constellation running and it interferes just in time to save the Enterprise from destruction by the machine. Kirk then orders Spock to relieve Decker of command, which he does so by pointing out that Decker is acting suicidally. Spock has Decker escorted off the bridge, but Decker manages to overcome the guard in a fistfight (why don’t they employ competent security personnel?) and steals a shuttlecraft (why don’t they have any security at all on the shuttle bay?). Decker flies the shuttle kamikaze into the machine’s maw, but the explosion barely affects it. However, the fact that it does have any effect at all gives Kirk the idea of doing the same with the wreck of the Constellation. Spock estimates that blowing up the ship’s impulse engines will generate an explosion equivalent to 97.835 megatons. Scotty sets up a 30 second delay trigger, giving Kirk barely enough time to beam out safely (why didn’t he set up a longer trigger? Or a remote detonation mechanism so they could explode the ship from the safety of the Enterprise??). Thankfully the 30 seconds lasts about 2 minutes of screen time, giving Scotty enough time to repair the suddenly failing transporter and beam Kirk out at the last possible second. Whew! It’s a whirlwind of edge-of-the-seat excitement. The plot is not overly complex, but it’s full of tension and keeps you glued to the screen. Definitely one of the classic episodes. And we’ll see Commodore Decker’s son appear later, in the first Star Trek movie. Tropes: Earth Shattering Kaboom, Made Of Indestructium, Doomsday Device, Outside Context Villain, Wave Motion Gun, Off The Shelf FX, Heroic BSOD, Large Ham, Antimatter, Nuclear Physics Goof, General Ripper, That’s An Order, Cardboard Prison, Roaring Rampage Of Revenge, Senseless Sacrifice, Self Destruct Mechanism, Deus Ex Nukina, Ludicrous Precision, Time Bomb, Magic Countdown. Body count: Entire crew of USS Constellation except Commodore Decker (off-screen before opening, killed when planet they were on was destroyed), Commodore Decker sacrificed himself in attempt to destroy the doomsday machine. This entry was posted on Sunday, 9 January, 2011 at 17:59	and is filed under Star Trek. You can follow any responses to this entry through the RSS 2.0 feed. You can skip to the end and leave a response. Pinging is currently not allowed.